Making kefir. The grains are supplied from the previous batch. A large spoonful is added to whole pasteurized homogenized milk and allowed to ferment at about 20C for 30 hours until the whey separates from the solids. I drink the mixed whey and solids. It is pleasant and never sour. I do not strain the grains and find the bacteria is present in all parts separated or not. This process makes reproducing dead simple. 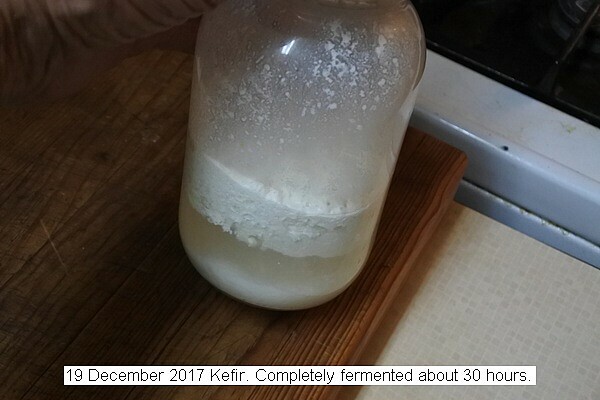 This entry was posted in Uncategorized and tagged 19 December 2017 Kefir, Kefir. Bookmark the permalink.